Did Abraham Lincoln “steal” Thanksgiving Day from the states? And was he merely a hired thug for the woman best known for a nursery rhyme? Before 1863, observing Thanksgiving fell to the province of the states. Having an annual day of thanks was controversial for many reasons; while Puritan in the making, Puritans such as Judge Samuel Sewall, who famously sentenced 19 people to death for witchcraft, feared people would feel entitled to the Lord’s bounty with an annual event. Some argued that a day of prayer should be called by the church, not civil authorities. 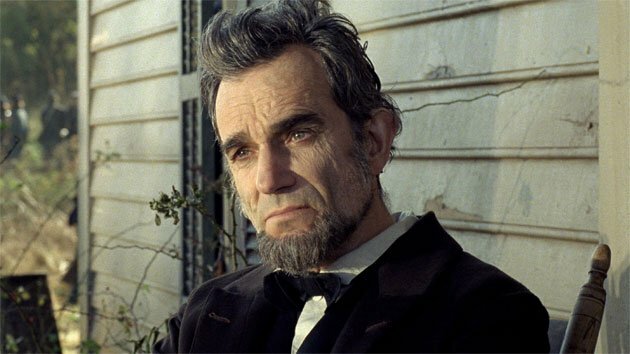 By the time Lincoln became president, however, many states in the Union (and even in places before they were states, like California and Oregon) had observed some form of Thanksgiving. The dates varied anywhere from September to January. Yankees, being an orderly lot, found this indiscriminate calendaring rather irksome. Especially bothered was one Sarah Josepha Hale, a novelist, magazine editor, and the poet who penned a ditty called “Mary Had a Little Lamb.” The “editress” of Lady’s Book — which had the widest circulation of any magazine — used her influence to make the last Thursday in November a national observance. Her unrelenting campaign started in 1846, according to Diana Karter Applebaum’s “Thanksgiving: An American Holiday, an American History.” Hale petitioned governors, missionaries, ministers, and no less than five presidents, and the fifth — Lincoln — was a charm. Ironically, while she had long pitched Thanksgiving as something to bring the Union together, Lincoln’s secretary of state William Seward pitched the idea as snatching a state prerogative — a notion that appealed to Lincoln’s sense of humor. Lincoln’s approval (well, actually Seward wrote the proclamation) may have been politically motivated, but that’s inherent in the holiday itself. Besides the aforementioned arguing Puritans, abolitionist evangelical Protestant ministers — like the Rev. Henry Ward Beecher, the brother of author Harriet Beecher Stowe (“Uncle Tom’s Cabin”) — would deliver sermons against slave ownership on Thanksgiving. Opposition to Thanksgiving also fell along abolitionist lines. Virginia Gov. Henry A. Wise, a slave owner and states’ rights advocate, replied tartly to Hale’s letter urging Virginia to adopt Thanksgiving. Hale herself urged readers, in the November 1859 issue of Lady’s Book, to honor Thanksgiving as a way of honoring the United States of America. 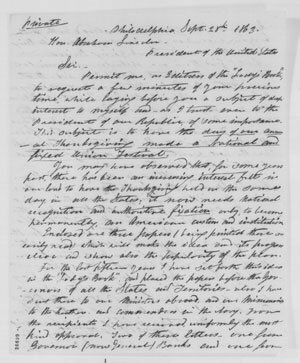 Lincoln’s proclamation was the first of many, but Thanksgiving wasn’t an official holiday until 1941, under President Franklin D. Roosevelt — and only because he had caused a huge ruckus when he had moved the date a week earlier for Washington, D.C.
A transcription of Hale’s Sept. 28, 1863, letter to Lincoln, by the way, is available online through the Library of Congress. In honor of Thanksgiving, Lincoln, and Hale, here’s a little twist: the last verse (yes, there are many) to “Mary Had a Little Lamb,” written in 1830.